Best of category and gold medal winner, Milagro. 4 Copas, 5150, El Agave Artesanal, El Duende de Don Felipe, Partida, Sol Azul. Best of category and gold medal winner, Chaya. Don Eduardo, Don Julio, El Caudillo, El Duende de Don Felipe, Milagro Select Barrel Reserve, Sol Azul. Best of category and gold medal winners, Chaya and El Agave Artesenal. 5150, Don Eduardo, Herradura, Partida. Best of category and gold medal winner, Don Julio 1942. The best way to test your knowledge and interest in spirits is to try them. Simple enough. But even for pros, putting together groups of 20 or more spirits from a category or sub-category can be time-consuming and a little overwhelming. That's why participating in competitions as a judge can be so enlightening. So, after tasting 60+ tequilas, mezcals and tequila cordials at the recently concluded Polished Palate Spirits of Mexico competition, I'm a lot more up to date, on brands that aren't in full national distribution, new offerings from major distillers (like Jose Cuervo's new Jose Cuervo Platino limited edition), and brands once tried and liked and now revisited against a range of other brands. The results of our judging (I was joined by my co-blogger Robert Plotkin, Beverages and More's Wilfred Wong, UK bar star and brand ambassador Charlotte Voisey, the Dallas Morning News' Louise Owens and Southern Wine & Spirits Tim Hirota) haven't been announced yet, but one of the highest scoring, and the winner of best of category in the new extra anejo category, was Don Julion 194, a creamy, lush and evolving extra aged tequila that actually delivers all those things aged tequila fans rave about - but more like an aged Central American rum than a Cognac, which is what fans frequently compare good old tequilas to. 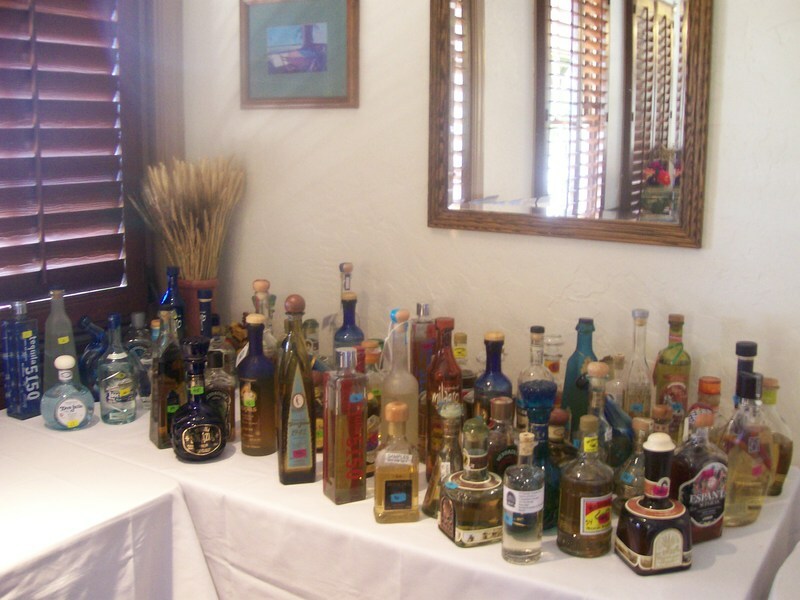 Other high scorers include Milagro Silver, Partida Silver and one of the organic tequilas from Four Copas. Full results later this week. Prices are high, sales higher, and even the latest U.S. lending crisis doesn't seem to have bothered consumers when it comes to beverage alcohol. The real worry, however, is the slow and steady attempt to blame the product and producers for human behavior. With the public melt-downs of pop stars a daily occurrence, the spotlight is shining on irresponsible consumption. Inevitably, producers, suppliers, bars and restaurants, will be blamed. So good for Pernod Ricard's just-launched responsibility web site. It's impossible to predict the effect, but more efforts, like this and Heineken's support in Connecticut of card ID technology, can only help. Visit the Pernod site and share your thoughts. The Country Vintner (TCV), an Australian-based wine exporter, announced the first wine produced with organic grapes in a Tetra Pak carton package is available nationwide exclusively at Whole Foods Market stores starting in September. The wine, sold under the name Green Path, is made by Organic One Wines, one of Australia's oldest and largest vineyards and winery establishments. Organic One Wines is a 100 percent organic vineyard and winery. These wines aren't available in glass bottles; they are packaged in a Tetra Pak carton, which is a paper-based carton that is more environmentally friendly. The packaging strategy is part of a growing idealism in which people, manufacturers, businesses, organizations and the government are participating to protect the environment for future generations. 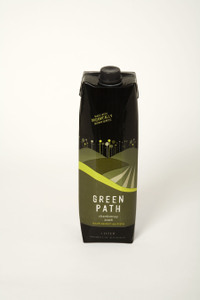 Green Path wine in the one liter Tetra Pak package is ideal for consumers who want to enjoy a quality wine in a portable, recloseable, safe and easy-to-use package. Tetra Pak containers are also very environmentally friendly not only because they are made primarily from a renewable resource, but also because the packages are lighter in weight than traditional bottles, requiring less trucks for transportation, thus reducing total greenhouse gas emissions. The wines are available in a Chardonnay and Shiraz, sourced from Organic One Wine's 280-acre vineyard -- The Billabong Vineyard in Jerilderie, New South Wales, Australia. According to Liz Mencel, managing director of The Country Vintner, there are many opportunities for Green Path with grocery stores and restaurants that promote natural products, wine retailers that support innovative packaging, forward thinking airlines and general retailers that support any type of environmental program. "We are excited about the prospects for Green Path in the U.S. and other markets. These are the first wines produced with organic grapes that are packaged in this format, which means great things for the environment in terms of both the wine and the package. Most important, the wines are of a fantastic quality and stand up on their own as fruit-forward, full-flavored Australian wines." "Whole Foods Market is excited to be one of the first to bring in a new age of eco-friendly packaging for wine in the United States," said Geof Ryan, global wine co-buyer for Whole Foods Market. "The Green Path organic wines are tasty and fruit-driven and show great quality and value for our shoppers." I've frequently noted the international creep of cork replacements, but have completely missed out until yesterday on what has happened in Austria. I was visiting a fairly new wine and spirits shop in Putnam County, New York, called Wineology, and while wandering among the shelves, noting what turns out to be a well-managed selection, I passed the small space set aside for Austrian wines, primarily recent grüner veltliners. These wines were on the "must-have" list of many sommeliers in the first part of this decade, but they were generally hard to find and few restaurants and retailers bothered. Apparently the albarino boom has eased the demand, because at Wineology, they are stocking seven recent vintages, all but one sealed with a screw-cap. And the other wine, a 2006 Hofer grüner, came in a liter sealed with a crown cap - a new use for all those old church keys. And not just a mega-production wine - this Geyser Peak is a $21 retail 2006 Sauvignon Blanc Block Collection, River Road Ranch, Russian River Valley wine, one with only 3,300 cases produced. 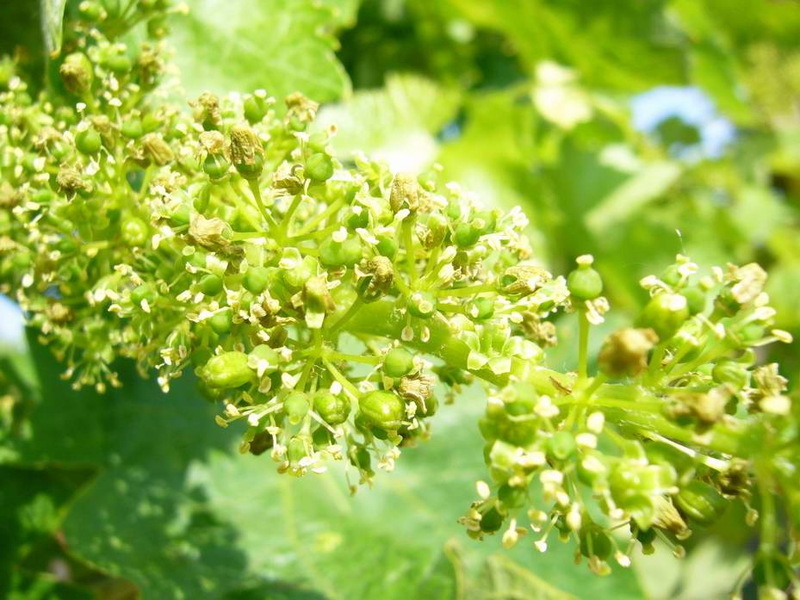 So while this move is not likely to be a market changer, it is a sign of wider acceptance for screwcaps when a winery that sells at least 250,000 cases of juice (as of 2005) follows the New Zealanders in sealing an ultra-premium priced Sauvignon Blanc with screwcaps. In fact, Geyser Peak marketing director Limeng Stroh credits the Kiwis in a release, saying that "...consumers purchasing this wine are also likely to have taken a similar interest in premium aromatic varietals from New Zealand..."
Geyser, owned by Beam Wine Estates, is just acknowledging the obvious - Sauvignon Blanc drinkers want their wine fresh and fruity, and have embraced the screwcap revolution. 2. But if some samples I received recently are any indication, more Southern Hemisphere reds are getting the cork-free treatment as well. Two arrived from importer Epicurean Wines without cork - one, the well-received Black Chook Shiraz Viognier 2006, with a screwcap, and the other, Woop Woop Shiraz 2006, using the Zork an Aussie innovation already used by winemakers much appreciated in the U.S. like d'Areneberg. Expect more and more of these closures to come. 3. "Green" marketing - that is, connecting brands to growing consumer concern with environmental worries - has broken into beverage alcohol. It's hard to be heard over all the new launch buzz these days, and as more and more organic brands are available - Pearl Vodka springs to mind - other newcomers are launching with their environmental bona fides apparently all in order. One, VeeV , is made with açai berries, prickly pear, ginseng and acerola cherry and "distilled base wheat spirit," meaning, I guess, neutral wheat spirit. For each bottle sold, brand owners donate $1 to the Rainforest Action Network and Sambazon Sustainable Açai Project. Additonally, each member of the VeeV sales force drives a Toyota Prius. I've been talking to a couple of Guys in the Know about the spirit biz, and we got to talking about a few brand moves and shakes coming up. I know most observers have been speculating lately about who will actually make the biggest bid and take over Absolut et al when the Swedish government does finally sell its wine and spirits monopoly, but there are apparently some big, medium and small moves soon to be made public. 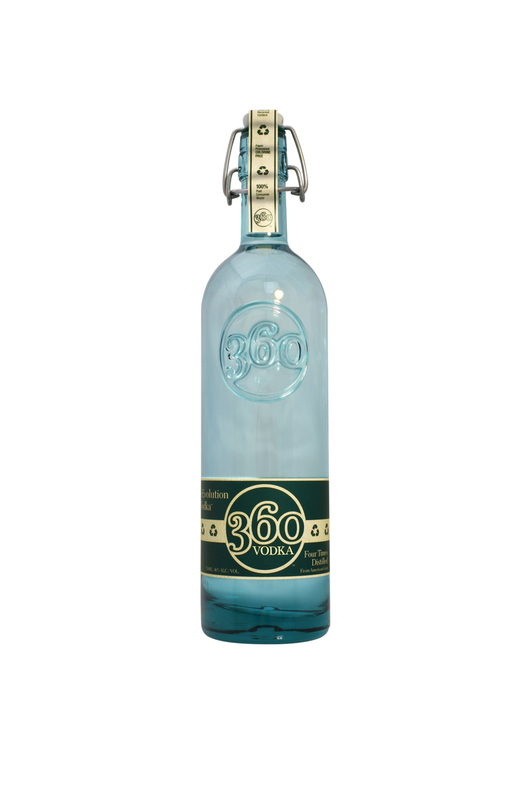 What big North American distiller, dissatisfied with the way two of its prestige brands are currently doing, will soon move them into a brand new American supply wing with a newly-acquired, skyrocketing top ten imported vodka brand? And about that Big Distiller: will it take three whole years for them to move their Top Ten U.S. brand on over from the Big House (where it now resides) to the new home and set up shop? And how many days will it be before the next Top Five U.S. distilled spirit supplier announces that they're ready to live and love cachaca? Gin-lovers have been talking themselves Pink Gin pink in the face for years from the sidelines, defending the mixability of the botanical spirit as the category slipped and the fashionably fickle fled to fruit flavored vodkas. But it took the efforts of some ambitious brand innovators - Hendrick's, Tanqueray No. Ten and Rangpur, for instance - and old favorites like Plymouth to stir things up in the past few years. Last year, in fact, domestic gins, which tend to be value products, grew a modest .5 % while the call brand imports jumped 2.6%. The botanical mix from gin to gin varies mostly by degree, with Hendrick's rose petal and cucumber combo the most uncommon. 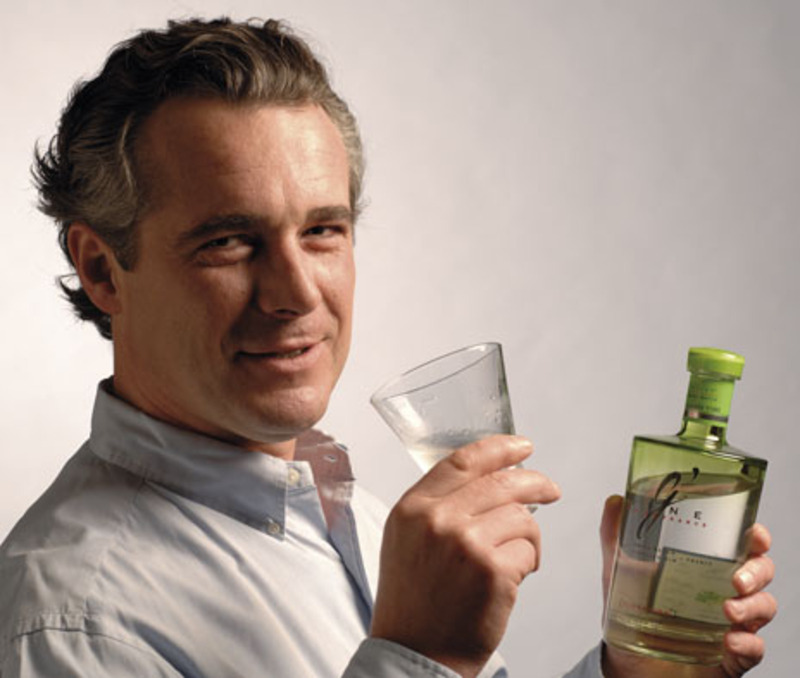 But along comes Jean-Sebastien Robicquet, who made his mark a few years ago when his EuroWineGate company worked with Diageo to create the grape-based vodka, Ciroc, with G'Vine, which he calls the first grape spirit gin, but more importantly, one that's made with grape vine flowers. Robicquet led me through a tasting earlier this week to show the evolution of his latest baby. The plain grape spirit was softer and more viscous than its neutral grain spirit counterpart, as you might expect, less spicy and easier. In his process, Robicquet then makes two sorts of spirits - a classic gin distilled to high proof and made with nine botanicals, including juniper, coriander, cubeb berries, ginger, cardamom and other ingredients, and a lower proof spirit infused with flowers harvested from ugni blanc grapes, abundant in the Cognac region of France where G'Vine is made - which are then redistilled. By itself, the grape flower infusion is more like a perfume or a cordial base, but as part of the full G'Vine package, the lovely floral aromas soften the assertive juniper punch many gins proudly proclaim. But this is not vodka dressed in gin's clothing. The grape spirit and flowers, it's true, make for a much softer gin than many others, but the delicate, honeysuckle and white blossom aromas and flavors in G'Vine knit the other botanicals together, creating a unique product and one that stretches the range of what "gin" is. Mixologist have taken up G'Vine readily, and that's not surprising; now that every apparent fruit flavor has been wrung into vodka, it seems to be the time of the flower garden. Combine ingredients in a shaker with ice and shake hard for at least one minute. Pout into a tall glass, top with soda water and garnish with a lemon wheel and lime zest. So I wasn't there to sample the latest Absolut iteration, the limited edition, mango-and-black-pepper flavored Absolut New Orleans. The Absolut people were kind enough to send a bottle over, so I could sip a glass quietly in the Brooklyn twilight, missing my cocktail peeps gathered in the steamy city to sip and schmooze. Mango spirits don't usually grab me, but this one turned out to be very sippable with that added pepper snap. However, I mention this launch not to praise the Absolut Spirits Co. for their flavor management but for offering profits of this one-off to organizations doing hurricane recovery work in the Gulf area, and for highlighting, after two long years, what various government agencies have failed at - the need to keep helping flood victims back to their feet. That's the second reason I was disappointed not to make it back to New Orleans again this week - a chance to spend some money, visit familiar faces and places and let them know that not everyone has forgotten. So bravo to Absolut for their innovative thinking and leadership - anyone else? Native Spanish-speakers are the backbone of the restaurant business - kitchens have long provided entry-level jobs and a career path for immigrants. Lately, more and more restaurants fill the front of the house staff with Spanish-speakers diligently learning English. Perhaps aware of this and other demographic trends, NYC's International Wine Center (IWC) will soon start offering the first Spanish-language wine certificate course in the U.S. The course is an eight-week program covering the major grape varieties and wine regions of the world as well as the fundamentals of grapegrowing and winemaking, and it includes a final examination. The instruction, course materials and exam are all in Spanish. Students who successfully complete the course will earn the WSET Intermediate Certificate in Wines and Spirits, an internationally-recognized credential awarded by the Wine and Spirit Education Trust (WSET), the world’s largest wine educational organization. “Considering the important role that Spanish-speaking individuals play in the wine, food and hospitality trade in New York City, it is only appropriate that a serious wine program be available to them in their native language,” says Mary Ewing-Mulligan MW, executive director of WSET programs in the U.S. and president of IWC. For detailed information on the WSET programs, email info@internationalwinecenter.com or visit the center's site.